Hello everyone! Can you believe it is time for my monthly "Star Products" list? This month *flew* by! What an exciting time of year with the change of season and the arrival of warmer weather!!! 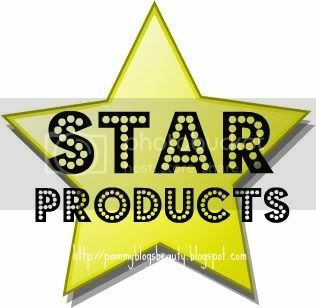 So, this month I have both a Star Products list here on my blog as well as a Star Products video for you to view. :) I will list everything for you below, but if you would like to hear a little bit more about each product, be sure to watch the video. 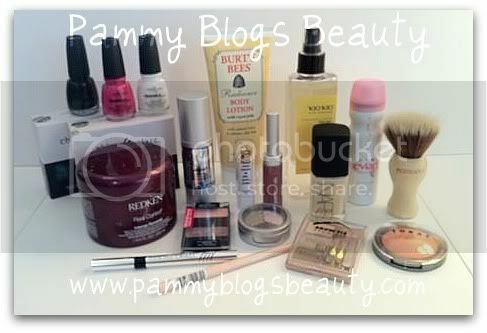 Some of these products have been mentioned before here on Pammy Blogs Beauty while others will be featured in upcoming reviews. For my Star Products list, photo, and video...please keep reading after the jump! Wet n Wild Coloricon Eye Shadow Trio Silent Treatment: I love this trio!!! One of the best sets from the new 2011 WnW collection! See my full review here! Pur Minerals Perfect Fit Eyeshadow Trio: Halo (from Heavenly Treasures Collection, see full collection review here) This trio is gorgeous!!! I always get compliments when I wear this one. This has been my go-to trio. It is subtle enough for day, but can give you impact for evenings too! Each individual shadow in the trio is totally unique (I don't have any dupes for any of these shades). The light green shade is particularly unique! The effect of all three shadows together is just so flattering! Pur Minerals Pout Pumping Lipgloss in Enchanted (also from Heavenly Treasures collection: see my full review here) This is totally a YLBB gloss! It is super moisturizing and just the perfect color for "everyday wear". Love it!!! LORAC Baked Matte Satin Blush Plush (review coming soon! See my video for more): This blush is so pretty! It really perks up my pale skin! Physicians Formula Eye Booster 2-in-1 Lash Boosting Eyeliner and Serum : 2nd month in a row! Still my current "star"! See my full review here. I don't do the "liquid" liner look everyday, but when I do, this is the only one I am reaching for. I need to get this in brown too! essence Long Lasting eye pencil in Almost Famous: This is just a pretty light pink automatic eyeliner pencil. I do my inner corners with this and sometimes my inner rim of my lower lashes. It was only like $1.00 at Ulta and I use it almost daily! Ecotools Bamboo Finishing Kabuki Powder Brush used with Evian spray to finish off face after powder foundation (for an explanation on this technique, check out the video. For my Ecotools Finishing Kabuki review, click here). This really gives a natural finish when you top off your powder foundation with this method. Thanks again to TiffanyD for this idea! If you have never checked out her videos, check her out here. China Glaze Crackle Collection (Yep, loving the whole collection! See my blog review here): What can I say? These are just FUN!!! Reviva - Vitamin E Stick (Review coming soon): I keep this multi-purpose lipbalm/vit E stick in my purse. You can use it under your eyes or on lips (or anywhere you are dry). My lips have been so soft since using this! Burt's Bees Radiance Body Lotion (see my full review here): This is perfect for Spring! I am soooo white now that we are wearing short sleeves again! This gives my white skin a glow that is so pretty. Glowy, not sparkly. Very nice! Your Best Face Boost Anti-Aging Daily Moisturizer: This product is amazing! My skin has been so nice since using this. You guys must check out my full review here!!! Redken Real Control Intense Renewal Super Moisturizing Mask: Do ya'll want me to review this one? This has made a HUGE difference in my hair this past month!!! My hair was previously so dry, and this has really brought it back to life! Kio Kio - Citrus petal and Tarata (and Kio Kio body products in general! Reviews are coming soon! ): Wow, this smells soooo pretty!!! (I don't know why my lips look so red in this video! The Pur Minerals Lipgloss in Enchanted is what I am wearing here. It is more a YLBB shade (muted neutral rose-pink). Thanks so much for reading and watching!!! Let me know what some of your month's faves are in the comments below! Or, comment if you have tried any of these products! I purchased almost all of these products. from Your Best Face, Reviva Labs, and Kio Kio. Great favourites! I really like the Physician's Formula eyeliner too-I've been using it every day since I got it! Great video, Pammy!!! Love the lip and the brows...doing the glam thing!!! Thanks for the mention!!! Great lip!! Thanks for the mention! @Brianna-Hey girl! :) Thanks! Tee-hee, "Glammy Pammy" :) Thanks for pointing me towards the brow kit. Love it!! !